A few days ago I posted a link to a blog article about the cost of longarm quilting. (To view this blog article Click Here) I also posted the same link on two FaceBook groups, Quilting Friends and Quilters Show and Tell. Both of these groups are open to all quilters and piecers who are at all levels of quilting. From the absolutely raw beginner to the very experienced and professional quilters. After posting the link about the cost of longarm quilting, there were MANY responses and comments to that post. 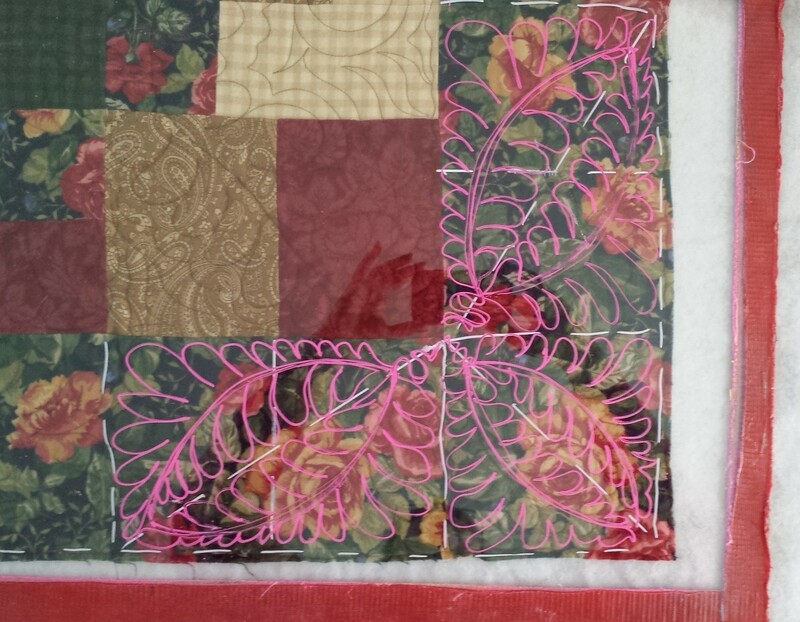 Most of the responses were encouraging and appreciative of what longarm quilters do for their pieced tops. If a longarmer ruins a pieced quilt top, does he/she carry insurance to cover the (at least) the cost of materials back to the customer? Two responses to a post, SO MUCH to write about!!!!! Where do I start??? Talk to your insurance person and tell them you have a quilting business. They will probably have NO clue as to what you do, that’s OK. Invite them over to your home/studio so they can see what equipment, supplies, etc., that you have. Make sure your coverage includes your equipment and the customer quilts you have in your possession. You need to KNOW what the (insurance) definition of “ruined quilt” is, what is covered for a ruined customer quilt and how a value of the ruined quilt is determined. If needed, get this information IN WRITING from your insurance person and keep it in your files. Tip – if your insurance person doesn’t know what kind of insurance you need, the magic words are “Inland Marine.” I have no idea what this means, but say that to an insurance person and their eyes light up and they know what to do! Let’s assume that the insurance definition of a “ruined quilt” is where the quilt is destroyed in a fire, flood, or other type of disaster – which I hope and pray NEVER happens to you. In other words, the quilt is totally un-usable in it’s ruined/destroyed condition. In most cases, it is up to your customer to provide receipts and records to document the $$ they spent on the fabrics, pattern, and any other supplies needed to complete the quilt top. Generally, there is no allowance made for the time it took to piece the quilt top. Even if your customer says that the quilt top is worth several thousand dollars, if they can’t DOCUMENT that amount, the insurance company may pay only a fraction of that amount! This is where you have to play detective and find out why your customer is saying this and what can be done to fix things. There can be MANY reasons for your customer to be unhappy – from machine and tension issues to unrealistic expectations. YOU have to talk to your customer and find out what (in their minds) is wrong. Did your customer say “do what you want” on the quilt and is not happy with what you did? Did you document that statement on your worksheet – that the customer signed and dated before leaving their quilt with you? How long after picking up their quilt is the customer saying they are unhappy with it? Is it within a day or two or has it been six months or longer? What is happening in your customer’s life at this time? Is she taking out her frustration from another situation on you? What does the customer expect you to do about this situation? Her solution may not be as drastic and you think it is? Hopefully you can work with your customer to come to a resolution of this problem. This may mean re-quilting some areas of the quilt, or possibly giving the customer a refund, discount, or credit for future quilting. For a short time, I will send you a FREE copy of the the Unhappy Customer article if you send a private email to me at longarmu@aol.com and request a copy. You WILL, at some time in your professional quilting career, have an unhappy customer. This situation should be handled in a professional way and your customer (hopefully) will be satisfied with the solution. Why Does Longarm Quilting Cost So Much? I found this on FaceBook and I think it is important for all professional longarm quilters to read. The writer of this blog post is spot on! I am a firm believer in timing yourself when you are working at your quilting machine. I keep track of the time it takes to quilt nearly ALL the quilts I work on. If the quilt is customer quilt, it is critical that I keep track of the time, and if the quilt is a charity quilt or even a personal quilt (what is that!) I keep track of the time. At a later date, I look back on these records and see if I can find any trends or information that is important to me and to my business. For example, many years ago I was doing a lot of sampler style quilts – many different blocks, most of which had borders and sashing. Not to mention the several outer borders, some with piecing and / or applique. By timing myself, I found that I was spending several more hours of my life completing this type of quilt than I was for a non-sampler type of quilt. Because of this information, when I quote a price for quilting a sampler quilt, whatever my base price would be, I will ADD at least and extra 25%, maybe more, to the price. Why? Because I KNOW, from past experience, and from timing myself, it is going to take me longer to complete this quilt. I have been timing my quilting for nearly my whole life as a professional longarm quilter (20+ years), and now I want to come into the modern age! I KNOW there has to be a app “out there” that can track my time for each quilting project. I usually use the stopwatch function on my “clock” app on my (Android) smartphone. But, the last few times I set my stopwatch, I also was using a radio app on my phone. When listening to music from my phone with my earphones, somehow, the stopwatch function shuts off! I have checked in the “app stores” and there are a ton of timing apps! They all say about the same thing and the reviews are pretty much the same also. So my question to you is – do you use a timing / project app and if so, what is it’s name? Is it easy to use, do you like using it and is there anything else you would like to share about it. Please leave your comments, app suggestions and any other information in the comments section. Thanks in advance for your advice and input!